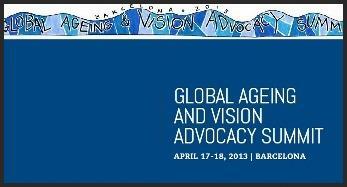 On April 2013, the Global Ageing and Vision Advocacy Summit brought together many experts to discuss the challenges of vision loss and ageing. The mutual goals determined by the Summit delegates were to drive political attention through advocacy, increase awareness with strong and coordinated communications and strengthen research capabilities globally toward decreasing the incidence and impact of vision loss especially in older age groups. The Summit stimulated critical and ground-breaking dialogue, which has led to new ways of thinking, speaking and advocating for vision health and ageing. At this seminal gathering of organizations and experts committed to improving conditions for older people, increased awareness and understanding, closer collaboration and powerful insights evolved. The final report of this summit is now available here.